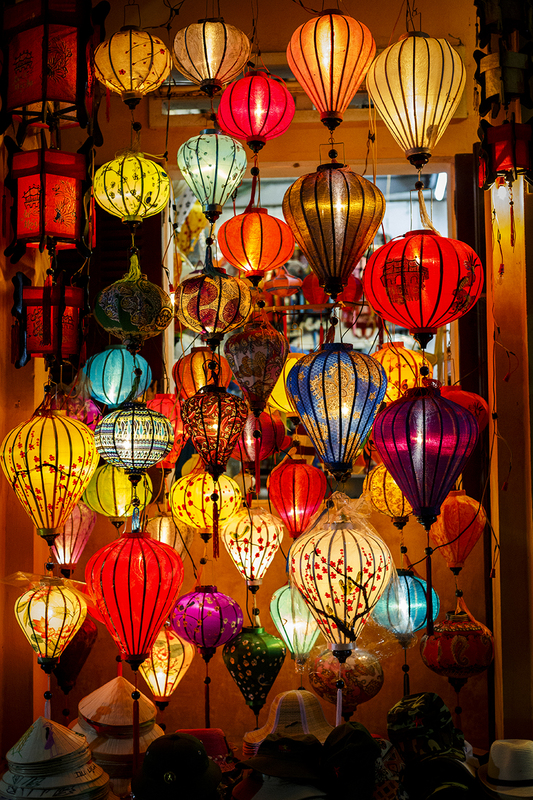 From the crazy bustle of Ho Chi Minh City, Hoi An couldn’t be more different. Quaint, quiet and picturesque – it feels like you’re walking the streets of an ancient town and that’s exactly what it is. 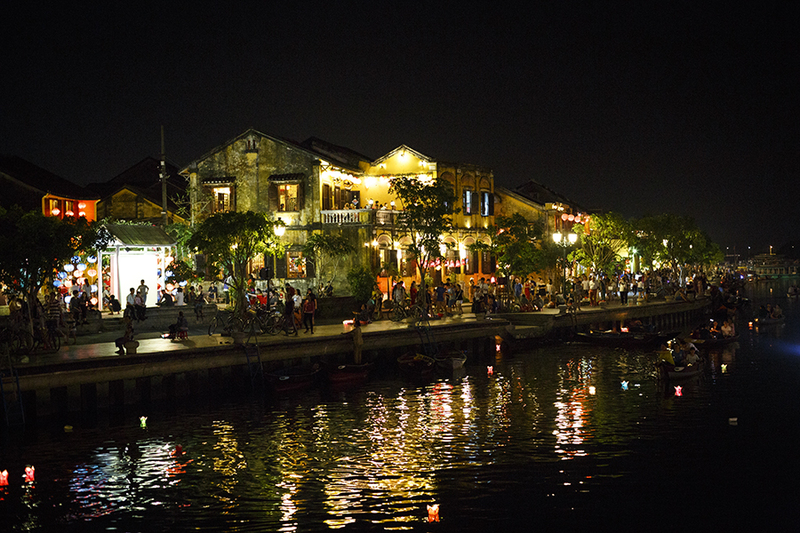 With no scooters or cars allowed in the town centre (it’s a walking and cycling zone only), Hoi An begs to be explored on foot. 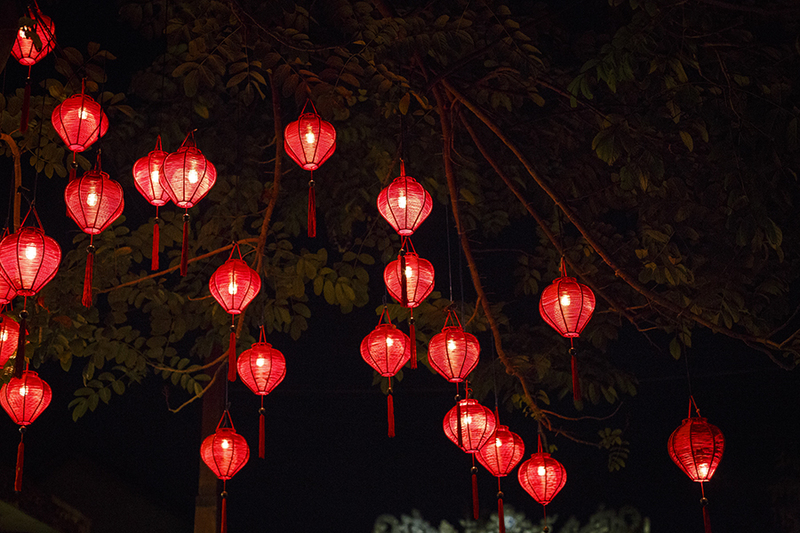 Without planning, we arrived on Vietnam’s Independence Day, which was followed by Buddah’s birthday. 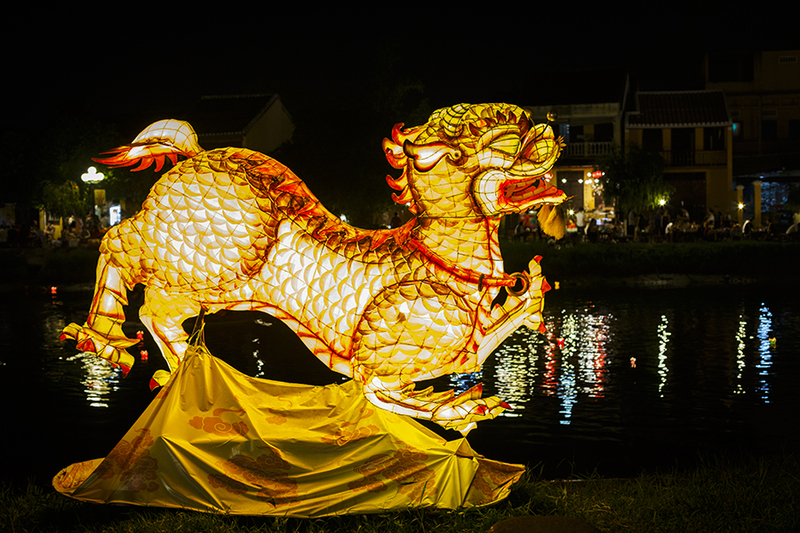 It was a magical experience – at night, brightly glowing silk lanterns were strung over the streets, giant fire-breathing dragons lined the river to watch over the thousands of candles floating in it’s waters; wishes sent adrift by locals celebrating the occasion. 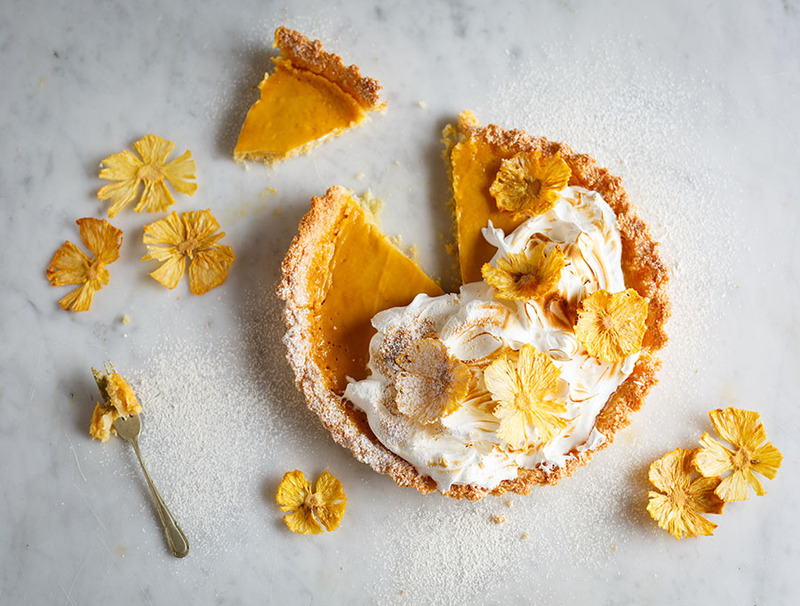 It is a breathtaking town – and the food isn’t too bad either! You cannot go to Hoi An without noticing their mild obsession with Cao lầu. It’s everywhere! 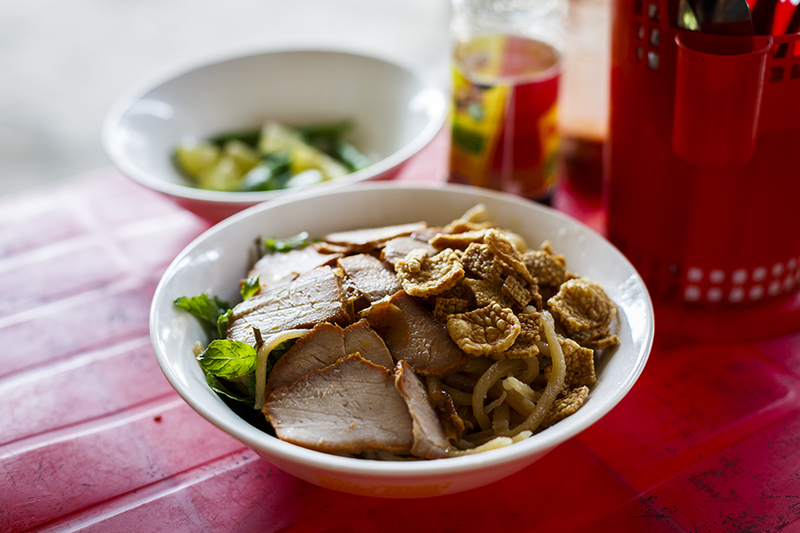 An intense pork broth/sauce sits at the bottom of a large bowl with chewy noodles and is topped with Vietnamese greens (morning glory, sawtooth coriander, mint, bean sprouts) and finished with crispy croutons. 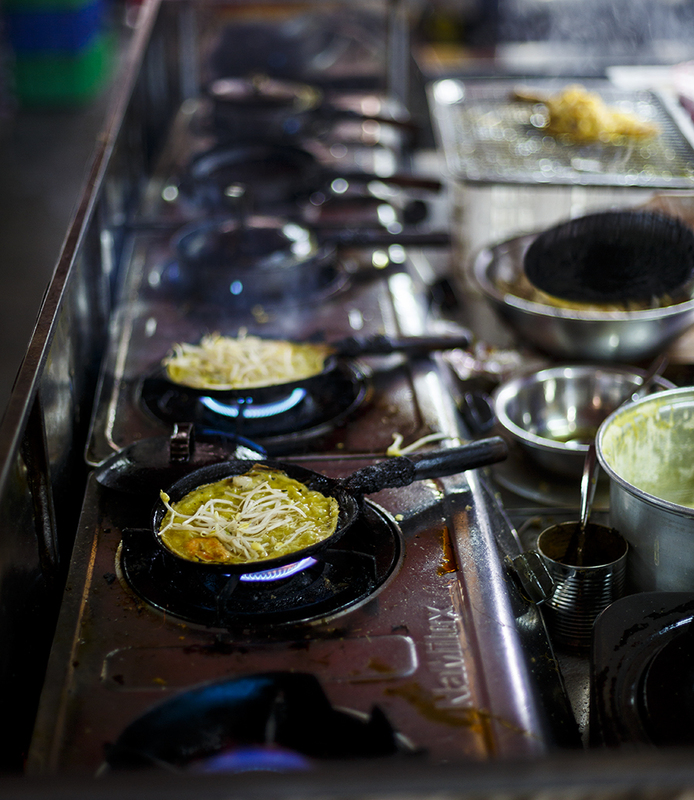 You’ll probably eat many, many bowls, just as I did, but none will compare to the one we stumbled upon down a random back alley (as is normally the case in Vietnam!). Another dessert highlight was a lady with a cart, selling flan – crème caramel to us. 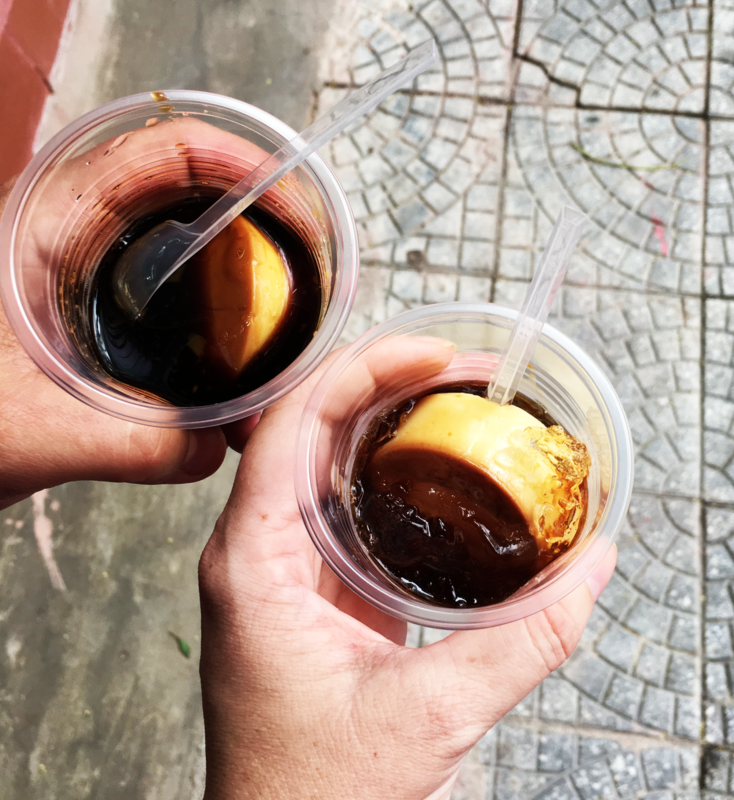 Served in little cups, drizzled with strong Vietnamese coffee the soft, perfectly cooked, quivering caramel was one of the best things I ate on my trip. 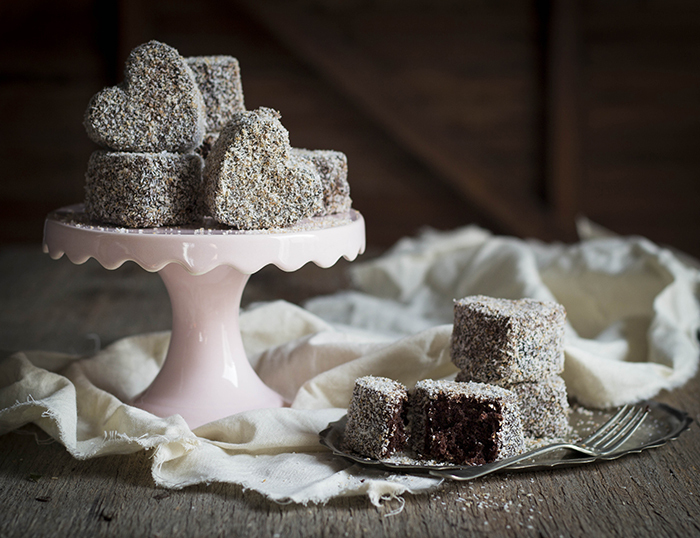 The next day, I went back to the same spot with a craving that needed to be satisfied, only to discover she was no longer there. I searched for Flan Lady the entire week and never found her again. So, if you find her, order 6, sit on the pavement and eat them before she leaves! 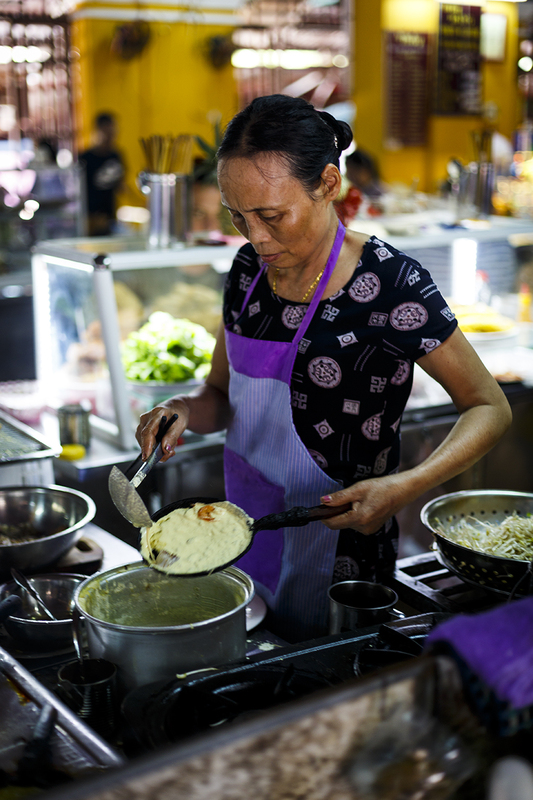 Speaking of cravings, you can’t go to Hoi An without doing a cooking class. 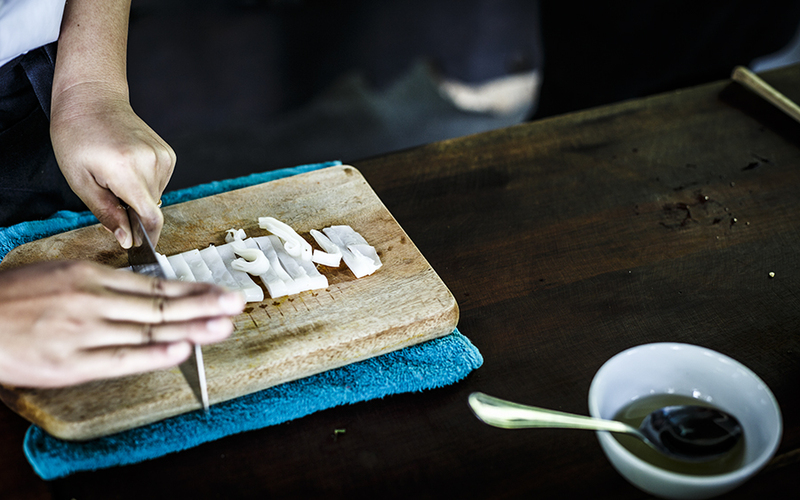 Once you’ve tasted Vietnamese food you’re going to need to satisfy your cravings when you’re back home. 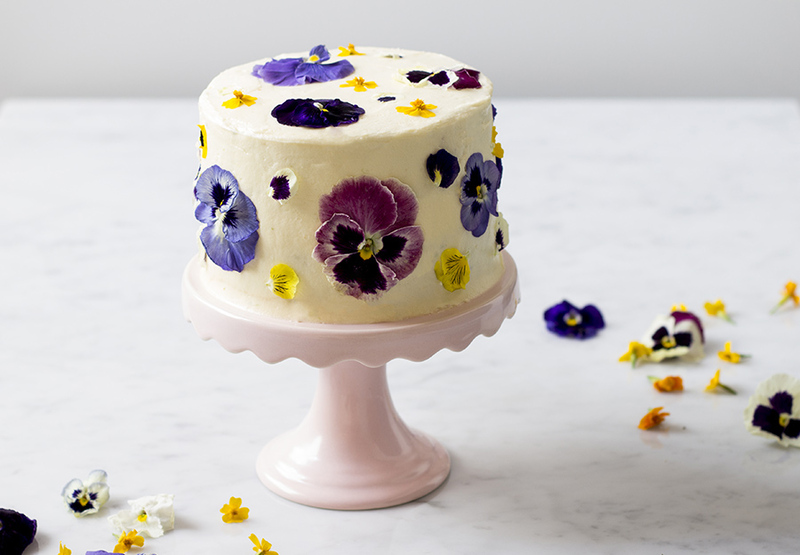 There are hundreds of places offering classes so it’s easy to get overwhelmed by choices. 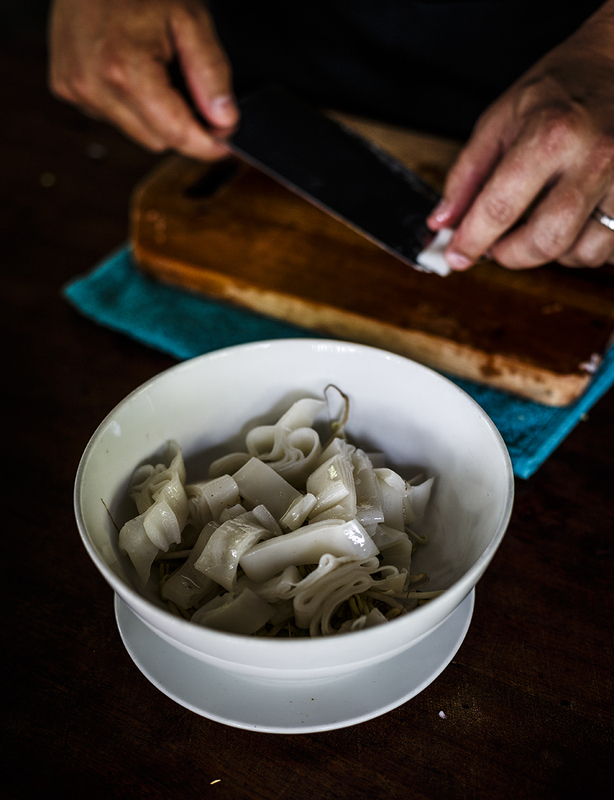 I only had one thing I wanted to learn to make; rice noodles and with Red Bridge Cooking School being the only one (I could find) that offered this, and it being run by professional chefs, the decision was easy. 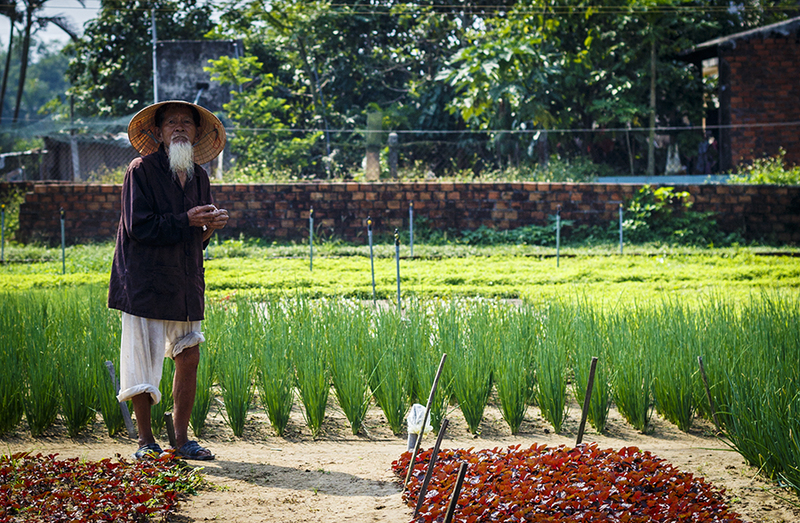 Our guide took us to the outskirts of Hoi An to Tra Que garden village where most of the town’s fresh produce is grown. Fields and fields of lush green herbs thrive as far as the eye can see without the use of pesticides and chemicals. The community garden is instead sustained by a special kind of algae found only in a lagoon in Tra Que. 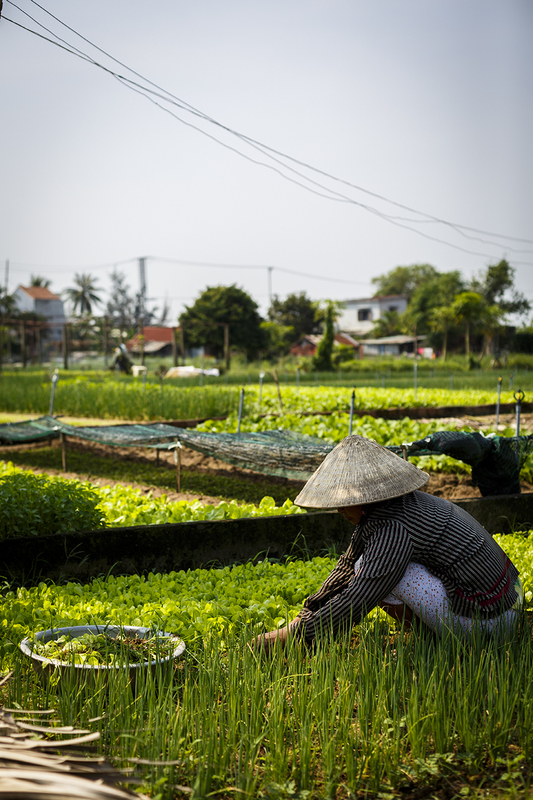 It is said that locals can taste the difference between Tra Que vegetables and those grown elsewhere! 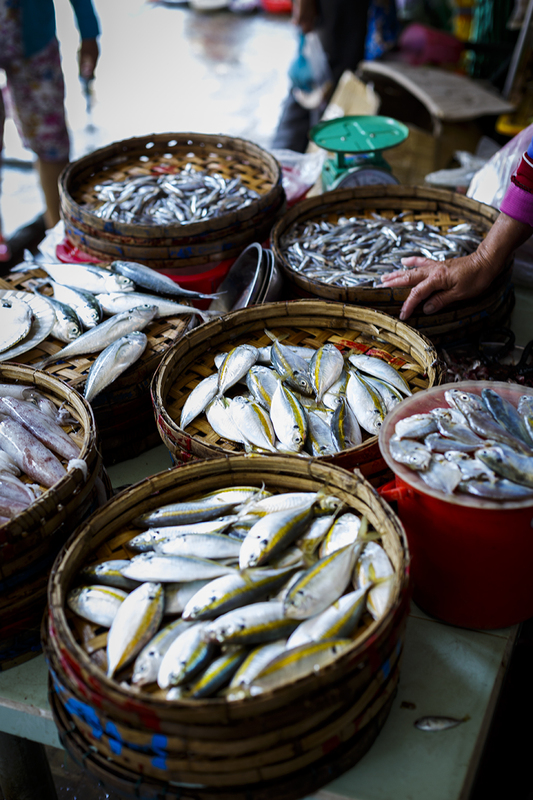 While we’d visited the main market in Hoi An, the school took us to one of the smaller, local markets – my camera had multiple orgasms. 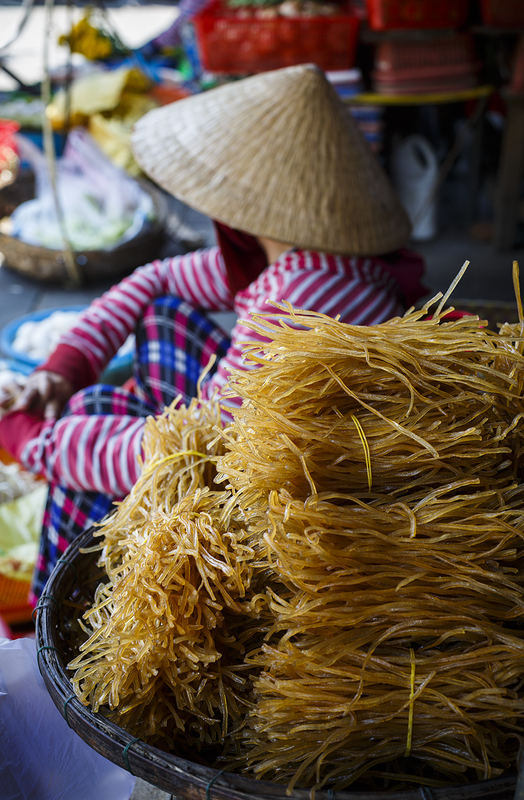 From ladies selling mounds of fresh noodles that are cut to your specifications, to bundles of dried cao lao noodles. 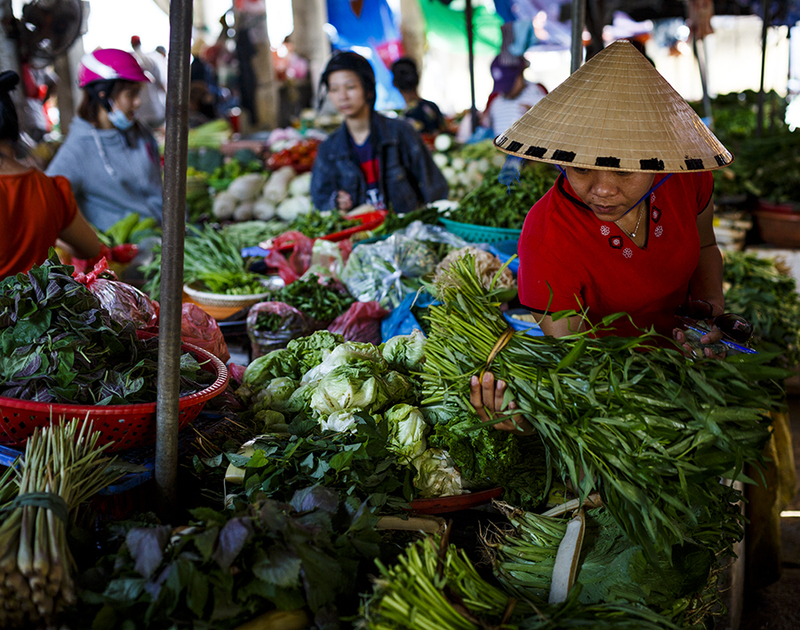 There were stalls dedicated to greens – including the bright green morning glory (a staple in Vietnamese dishes), a lady shredding coconut for you and the fish! Handwoven baskets hold various shellfish, crabs and glistening fish still flipping around after being plucked from the river mere hours ago. Instagram heaven! Next, we headed to the beautiful school on the banks of the Thu Bon River. 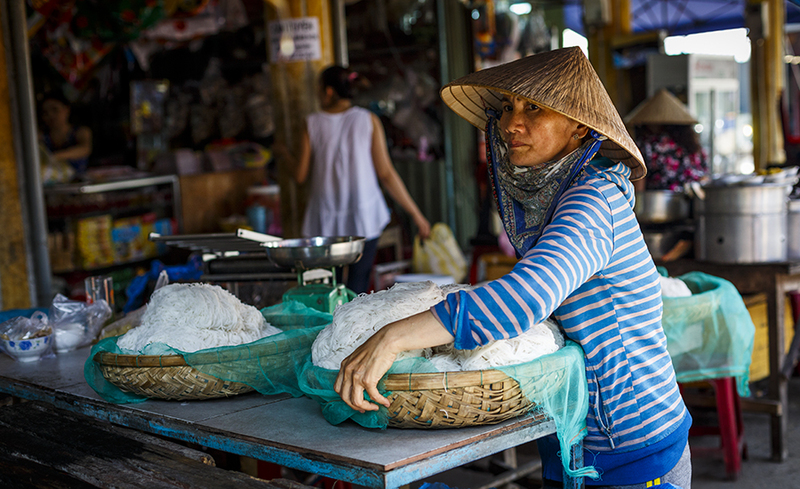 We learnt to make pho (the national dish of fragrant broth, thinly sliced beef and rice noodles), a Vietnamese chicken salad with green papaya, green mango and rice crackers and finally, rice noodles. 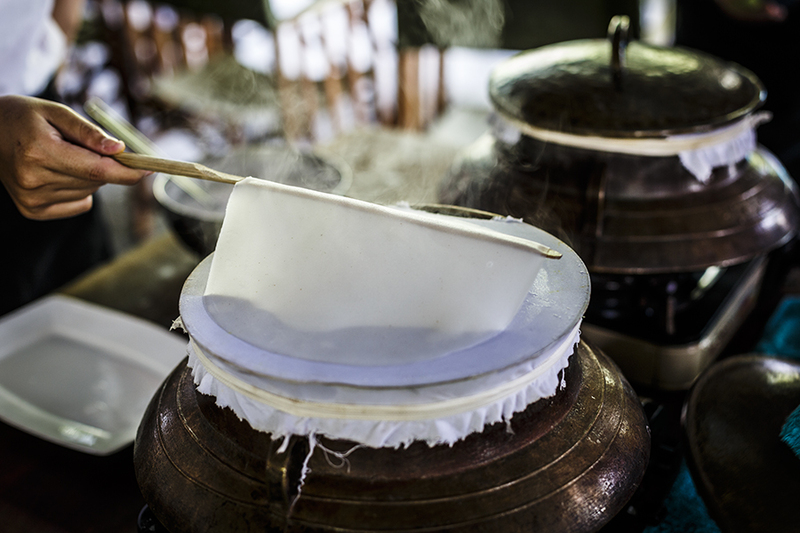 Rice noodles are made by soaking rice overnight then blending it to form a batter. 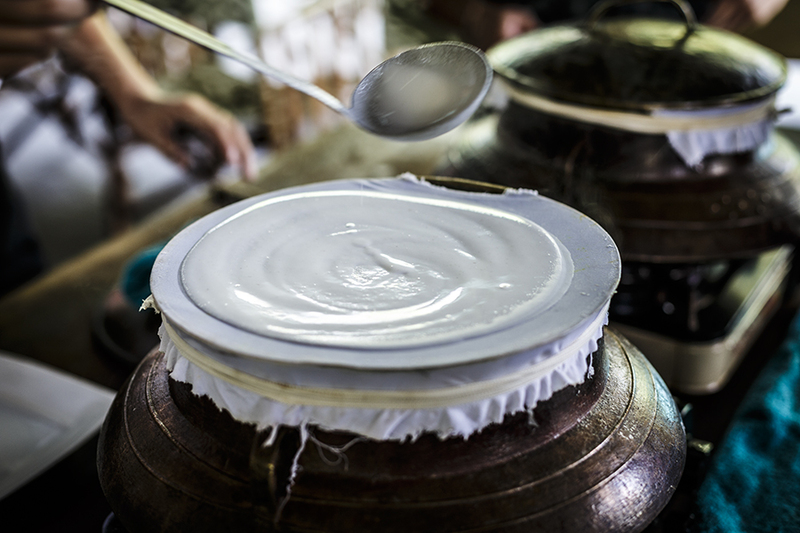 The batter is ladled onto a simmer pot of water over which a thin piece of silk has been pulled very tightly. 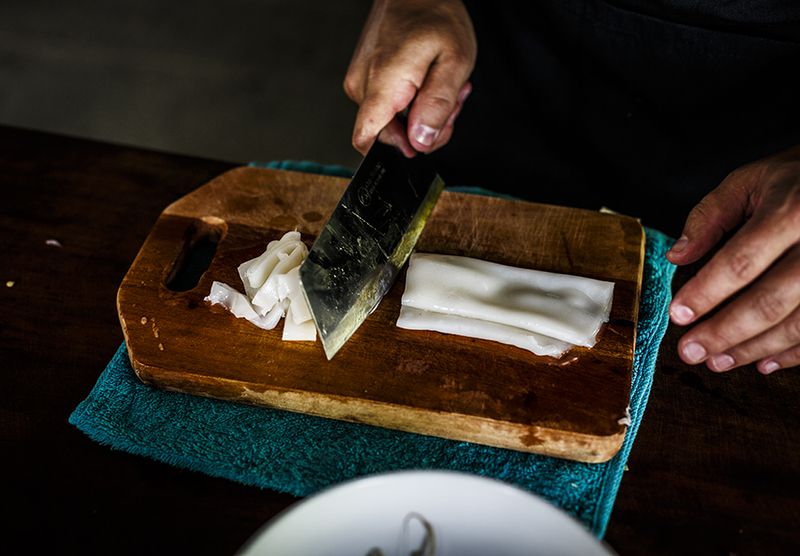 After a quick steam, the noodle sheet is lifted off, brushed with oil and cut into strips (or put through a cutter). 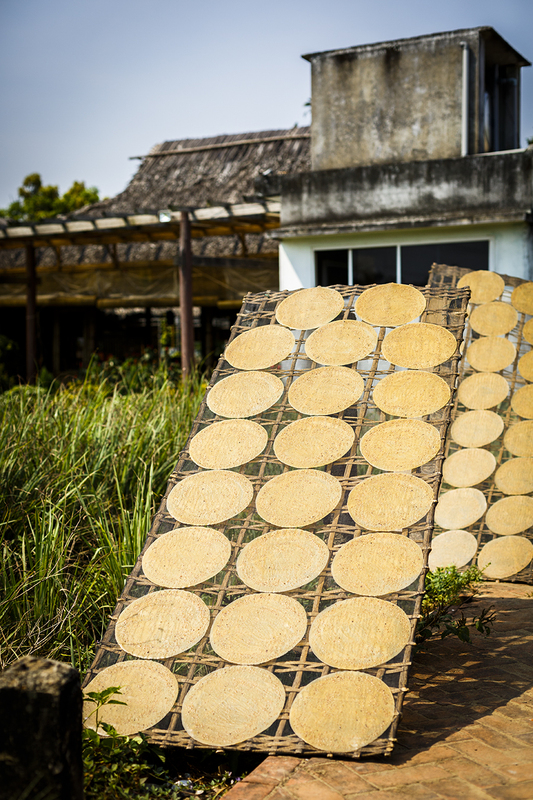 To make rice sheets (the kind used to make rice paper rolls), the noodle sheets are placed outside in the sun to dry until crisp. 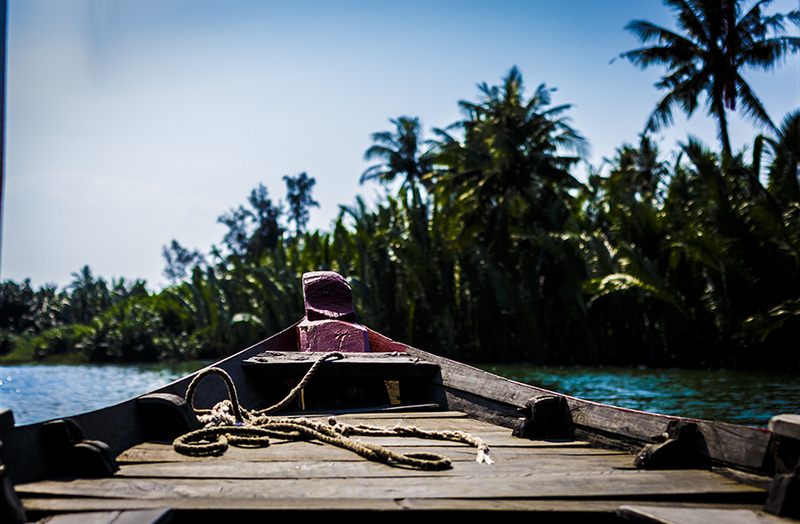 After sitting down to enjoy all the traditional dishes you’ve cooked, take a quick dip in the school’s swimming pool before returning to Hoi An via boat. A day well spent! 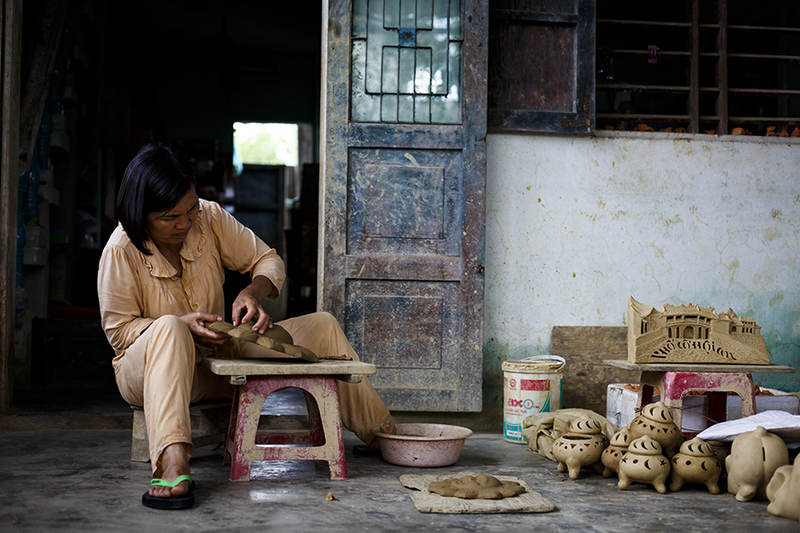 If you need a break from all the food, a visit to the Thanh Ha Pottery Village is worth it. 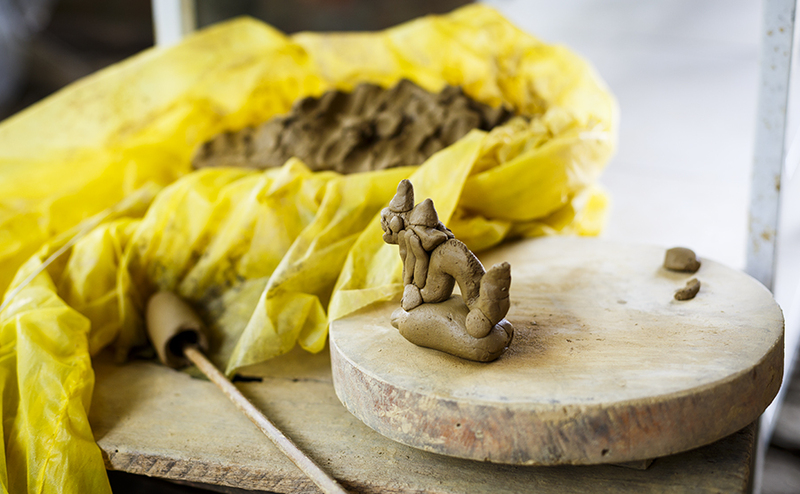 We rented a scooter for the day and explored the sleepy seaside village where terracotta clay is transformed into bowls, pots and whistles by locals with nimble hands. Skip the boring tourist traps and head straight to the small alleyways along the seaside where you can watch the process. We ordered an amazing Cao Lao on Pham Phan road (opposite the antique shop) and while waiting for our food, one of the locals next door taught me to make one of the traditional whistles. 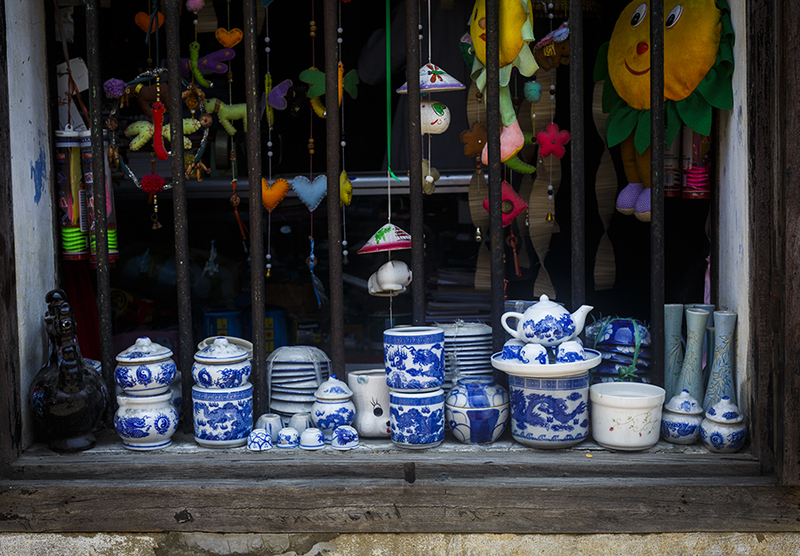 Vietnamese people are extremely friendly – I was blown away by their generosity and openness! If you’ve already read my post on Ho Chi Minh City, you’ll know I went on an epic trek to find the best Banh Mi in the city. Well, it was definitely not the best in the country. That title, I think, belongs to, not Madame Khan (Anthony Bourdain’s favourite – tried it, and it was average) but to an unassuming man and his wife with a tiny little trolley down a street that very few tourists wanted to go down. He makes a fire to warm the baguettes so they’re gorgeously crusty and his pate is rich and luscious. We ate there every single day and every day we left he’d say ‘Same tomorrow?’. Visit him. His card is opposite Nhà hàng Chợ Phố in Nguyễn Hoàng street. I seriously despise savoury pancakes but the one’s this lady makes? Boy, are they a game-changer. They’re not really pancakes as we know them. 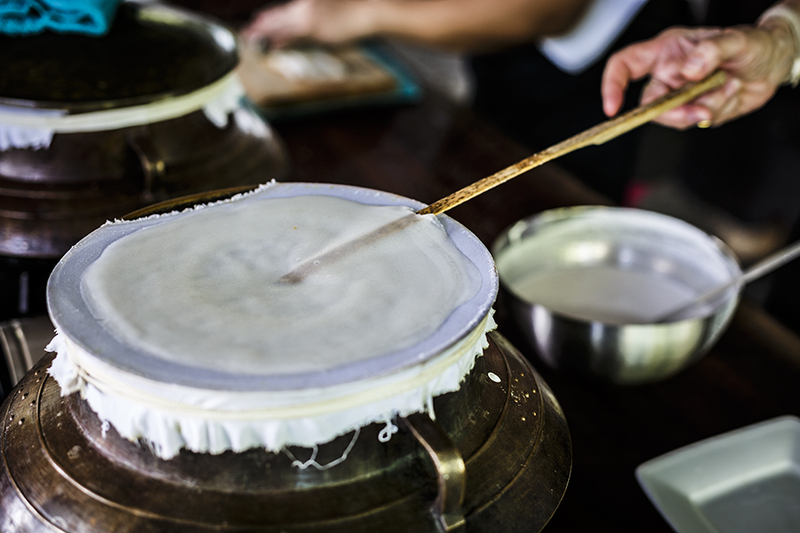 Called banh xeo or Hoi An pancakes, rice flour, turmeric and coconut cream are mixed together before being poured into a piping hot pan. 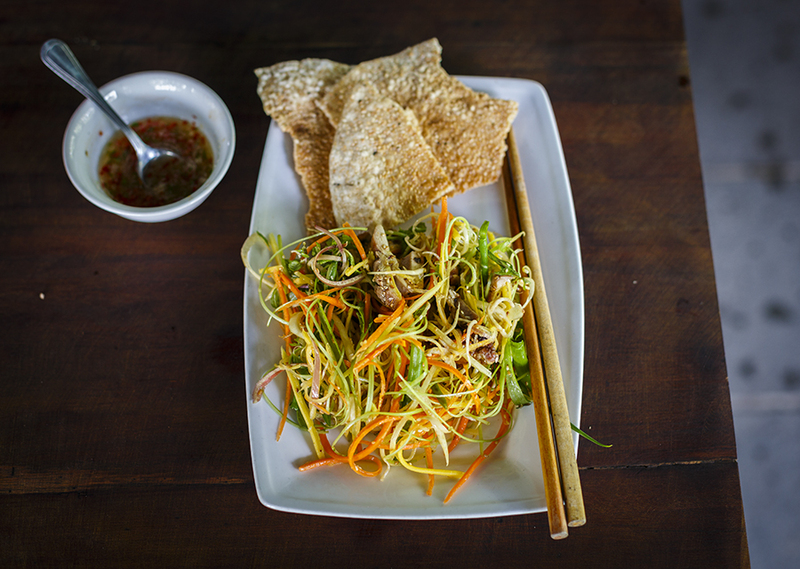 It’s then topped with prawns and bean sprouts and cooked until the edges go crispy and frilly. 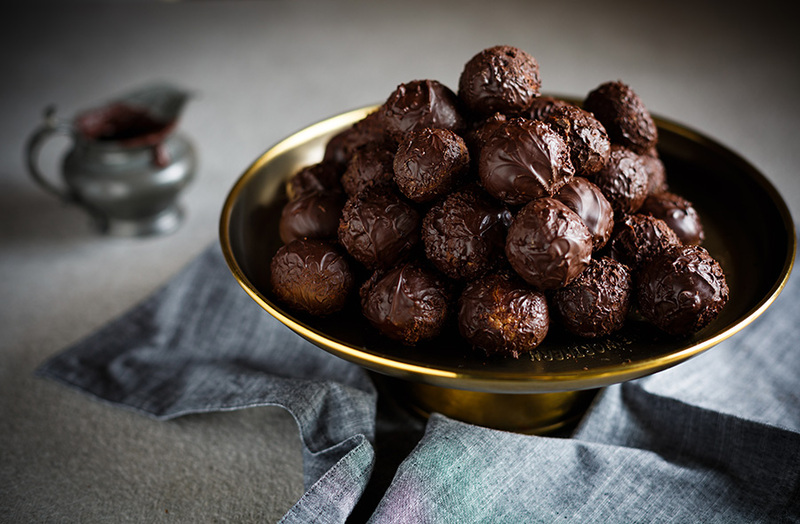 Served with greens, you form little parcels of deliciousness which you pop into your mouth.